At Poskod.my we like to see the city being used in new and creative ways, so we were excited to attend an open picnic organised by The Impatient Sisters. At Poskod.my we like to see the city being used in new and creative ways, so we were excited to attend an open picnic on Sunday, organised by The Impatient Sisters. 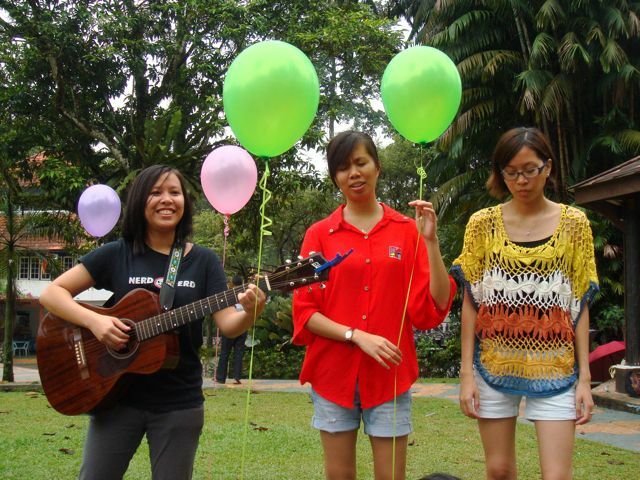 The musical sisters transformed the Lake Gardens into an acoustic gig and intimate party for an afternoon. Just a stone’s throw from Sentral station, the historic park – also known as Taman Tasik Perdana – was the perfect venue for a relaxed gathering. We often forget that there are acres of greenery so close to the city centre, and the park is well worth a visit in its own right. The Impatient Sisters, originally from Kuantan and now based in KL, adopted a corner of the park for their party, drawing friends and fans with a free flow of food and conversation. Even a little afternoon rain (read: thunderstorm) didn’t dampen the spirits. The highlight was of course the singing from the sisters themselves, as they performed some new songs alongside old favourites like “Ark” and “Love”, their vocal harmonies enchanting both picnickers and passers-by. We can’t help but hope that The Impatient Sisters have started a picnic trend in KL. Yeah, we know Malaysia is hot, humid and beleaguered with mosquitoes, but the sisters have shown that with goodwill and a little group effort, it can be done!